@Fackinloaded, I often cuddle people who haven't met me. @TheBigJ, Kirby's callin' the police! Until you can't remember their name, then it's the opposite of comfortable. @crazysheep, You had me at tears off *tears off pajamas to reveal dicky wicky* "Oh boy, time for a sucky wucky, OwO"
I don't know about you folks but one of the worst night's sleep I ever had was sleeping for the first time with someone I had been dating. Granted, I spent the whole night with blue balls because they were exhausted and that's okay, but it can make it very *hard* to sleep. 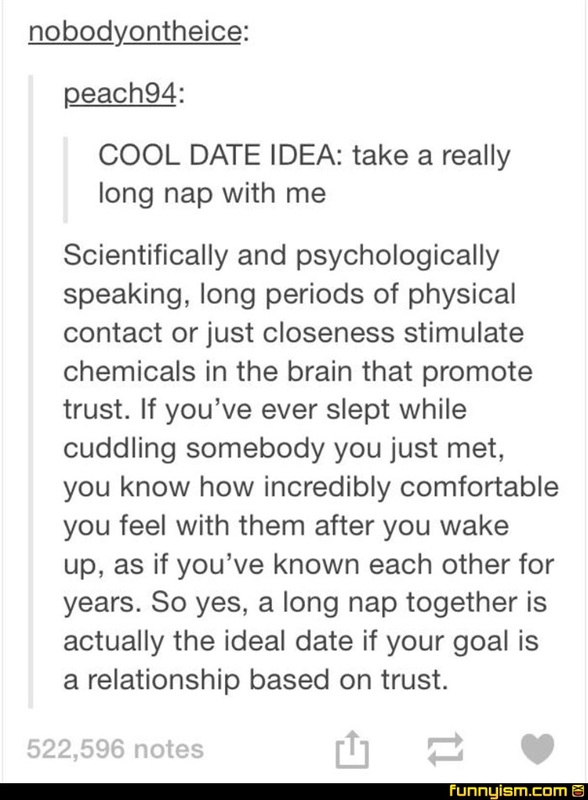 Or if you're looking for an easy way to make someone trust you so you can take advantage of them later. You guys are receiving physical affection??? But it wouldn’t be real “trust”. Just some fake, induced trust.